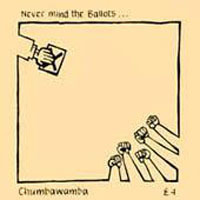 Album "Never Mind The Ballots"
Welcome to Never Mind The Ballots. The phone lines are now open. If you'd like to put a question to the candidates the number to ring is 0532779463. You want jobs? I've got jobs! Hospitals? Top of my list! Schools, prisons? Of course we'll build them! Condoms for the American GIs! Police oppression? You can have it, sir! Hello, we've got our first caller. You're name's Martin. Hello Martin. You disagree with ourstatement policy. Well Martin to tell you the truth I couldn't agree with you more. It's outrageous, disgusting. But unlike my colleague on my right, we're the party who say what we do,do what we say. You can bank on us Mart! Good evening, Shirley. I'm so glad that you've rung. The matter is as dear to me as it is to you. Give me four years and I'll get right down to it. Because unlike my little balding colleague on my left, we don't make promises we can't keep. You want a war? No problem!